Ann Rheum Dis. 2012 Apr;71(4):524-7. doi: 10.1136/annrheumdis-2011-200402. Epub 2011 Nov 9. 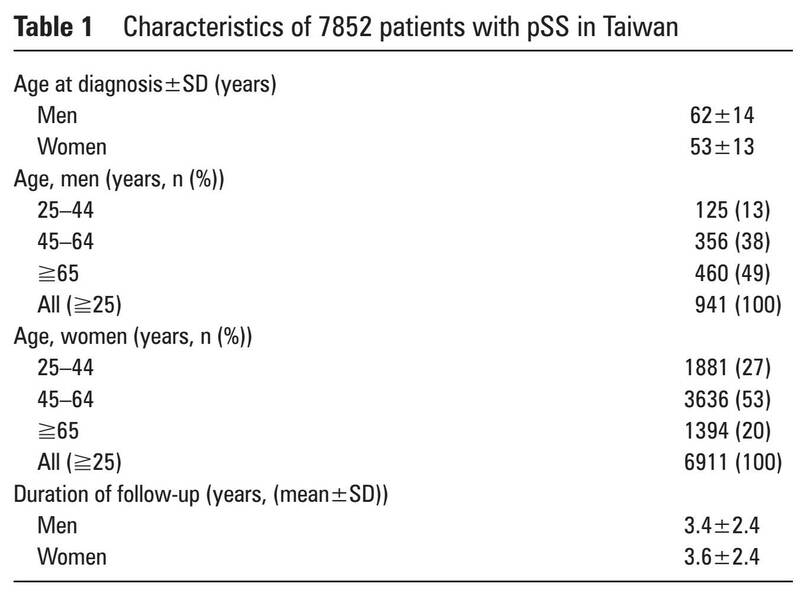 Incidence of cancer in a nationwide population cohort of 7852 patients with primary Sjogren's syndrome inTaiwan. Weng MY1, Huang YT, Liu MF, Lu TH. Patients with primary Sjögren's syndrome (pSS) are at a higher risk of developing non-Hodgkin's lymphoma (NHL). However, little is known with regard to the risk of developing cancers other than NHL. 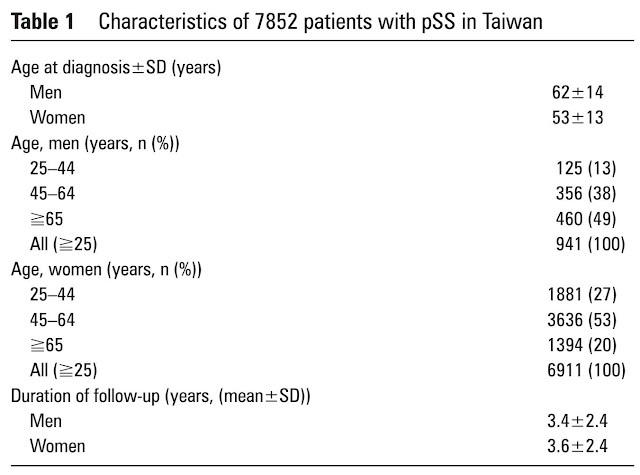 The authors aimed in this study to compare the incidence of cancer in various sites among patients with pSS with the general population of Taiwan. The authors used National Health Insurance claims data to establish a nationwide population cohort of 7852 patients with pSS from 2000 to 2008 who did not have cancer prior to diagnosis of pSS. Incidence and standardised incidence ratios (SIRs) for cancer in various sites were calculated. 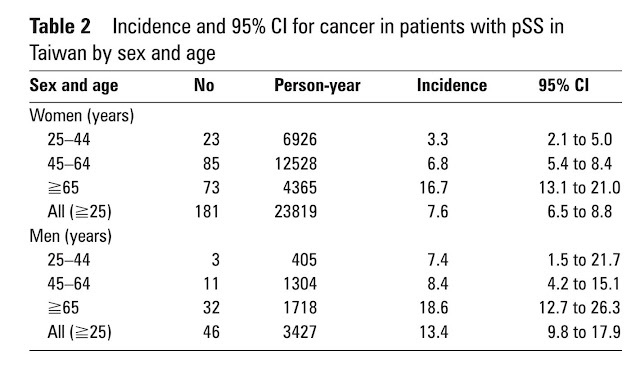 Among patients with pSS, 277 (2.9%) developed cancer. 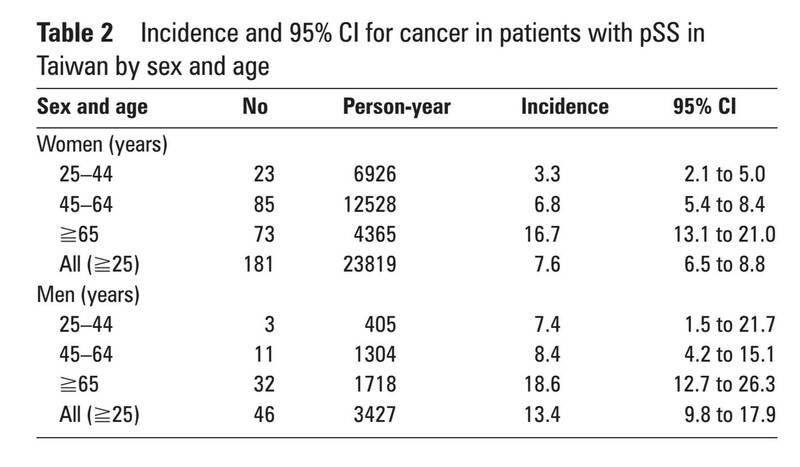 The SIR for cancer was 1.04 (95% CI 0.91 to 1.18) among patients of all ages with pSS and was 2.19 (95% CI 1.43 to 3.21) for patients aged 25-44 years. 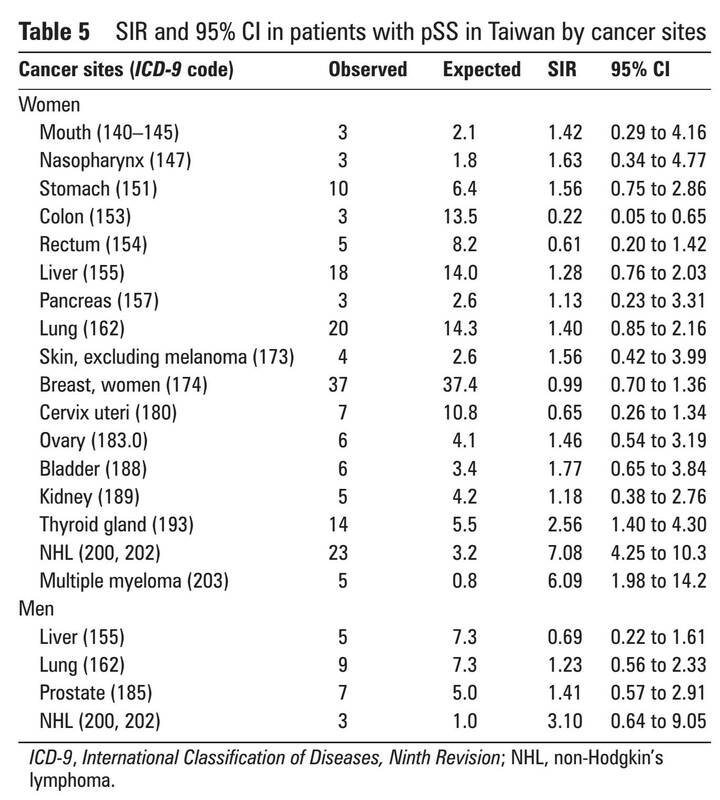 Female patients with pSS had a higher risk of NHL (SIR 7.1, 95% CI 4.3 to 10.3), multiple myeloma (SIR 6.1, 95% CI 2.0 to 14.2) and thyroid gland cancer (SIR 2.6, 95% CI 1.4 to 4.3) and a lower risk of colon cancer (SIR 0.22, 95% CI 0.05 to 0.65). In contrast, male patients with pSS were not at a higher risk of developing cancer in particular sites. Patients with pSS, overall, did not have higher risk of cancer, and only patients aged 25-44 years were at an increased risk of cancer compared with their counterparts in the general population. Cancer screening for patients with pSS, especially female patients, should focus on NHL and multiple myeloma and thyroid gland cancer.